Previous: Peanut Butter Oreo Brownies! Oatmeal chocolate chip cookies are a classic. They’re the chocoholic’s spin off from the traditional oatmeal raisin cookie that Grandma used to make. 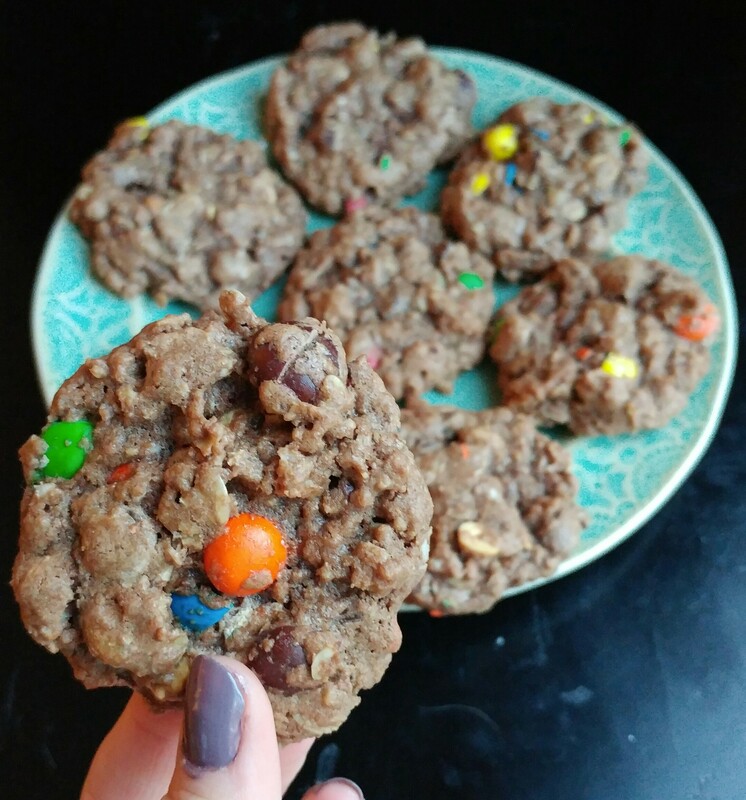 So I was thinking, how about make a chocolate oatmeal cookie, increasing the amount of chocolaty-goodness in each bite?? Well, here it is! These have the texture and flavor you know and love from oatmeal, with the added flavor of cocoa in each and every bite. Add in mix-ins as you desire– Chocolate chips and toffee? Peanut butter chips? Coconut? M&Ms? Peanut butter cups? White chocolate? The choice is yours! These have m&ms, chocolate chips, and peanut butter chips. Hokay, it’s baking time, wouldn’t you say?? Here we go. 1) Preheat your oven to 350 degrees F. Line baking sheets with parchment paper or silpat mats. Set them aside. 2) In a medium-sized bowl, whisk together the flour, oats, baking powder, baking soda, salt, and cocoa powder. Set it aside. 3) In the bowl of a stand mixer (or other large bowl), place the softened butter, granulated sugar, and brown sugar. Beat them on a medium-high speed until light and fluffy and a pale yellow color. Use a rubber spatula to scrape down the sides of the bowl. 4) Add the eggs and vanilla extract into the butter mixture. Beat on a medium speed until fully incorporated. Continue to use the rubber spatula to scrape the sides of the bowl as needed. 6) Now, we bake! Using 2 spoons, or a cookie scoop, drop the dough onto the prepared cookie sheets leaving about an inch between each cookie. 7) Bake the cookies in the oven for about 8 minutes, or until the dough looks set. Make sure not to over-bake! They’ll keep cooking a bit on the baking sheet after you take them out of the oven, so air on the side of baking less. 8) Cool the cookies on the baking sheet for about 3 minutes. Then, transfer them to a wire cooling rack (or plate, etc. Something not hot). Continue this process until all the cookies are made! NOM 😀 Enjoy them warm! If you aren’t serving all of them right away, cool them completely and then store them in an airtight container.